Gnocchi are a cross between pasta and dumpling. Perhaps the best known are potato gnocchi, but they can be made from a variety of ingredients, including semolina, wheat flour, or bread crumbs. Also ricotta, with or without spinach, which is probably one of the original versions. The people around the Mediterranean were making gnocchi for centuries before the introduction of potatoes from the new world. Semolina or ricotta gnocchi were very common. I feel a special affinity for potato gnocchi because they are related to one of my favorite foods: Lefse – Potato Flatbread from Scandinavia. Well, OK, lefse is cooked on a grill and gnocchi are boiled in water or milk, but the basic dough is very similar. Potato gnocchi are becoming quite common in American grocery stores, but you can make your own. See Italian Food.about.com recipe by Kyle Phillips (2) or Gourmet Food.about.com recipe by Brett Moore (4) for a basic potato gnocchi recipes; or How to Make Potato Gnocchi (3) for a video recipe (video begins with an advertisement). The basic ingredients are: potatoes, flour, and salt; most recipes also include egg. Different recipes vary on the amounts, so one must experiment. Brett Moore’s recipe (4) calls for 2 pounds russet potatoes, 2 cups flour, ¼ tsp salt and 1 large egg. Kyle Phillips’ recipe (2) calls for 2 ¼ pounds russet potatoes, 1 ½ cups flour, pinch of salt and no egg. You can see that these recipes, which serve 4 as a main course, or 6 – 8 as a first course, are not consistent, which is typical. I have not yet experimented, so do not have a recipe to offer. Use a mealy type of potato, such as russet; you want the mashed potato to be fairly dry (moisture makes them gluey when mashed). To cook them, either steam or bake. Boiling is not recommended because they will absorb too much water. Do not mash potatoes until fully cooled (no longer steaming). It’s best to use a mixer to mash them, because you don’t want any chunks. Some recipes recommend grating them, or using a ricer, but these methods will leave some chunks. It’s important to have enough (but not too much) flour in your gnocchi. If not enough, they will dissolve while cooking; if too much, they will be tough. I’ve not yet made potato gnocchi, because I can now find them ready made at the grocery. Let me know what works best for you! I had lost my recipe for this. I remembered it as being very simple, so I tried the following (reduced proportionately to serve 1); see testing below. See also a recipe from Rogue Creamery, below. 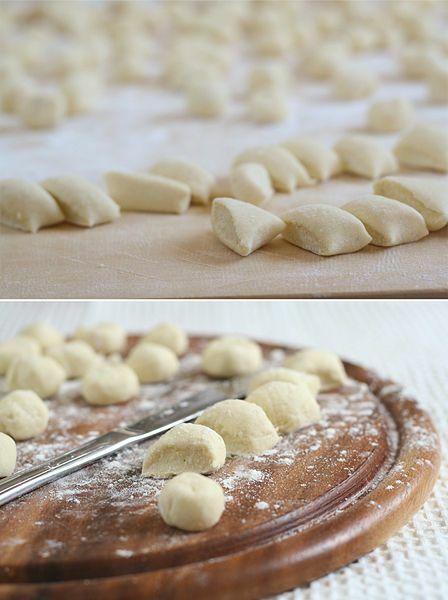 Cook gnocchi in gently boiling water; remove with slotted spoon and keep warm. Melt butter in a skillet. Add leek, and saute until wilts. Stir in 2 – 3 cups crumbled gorgonzola cheese and 1 cup heavy cream until warmed. Check seasoning with Unrefined sea salt and freshly ground black pepper. Toss cooked potato gnocchi with sauce to combine. Serve immediately. I made up a batch for 1 serving as follows: 2 very thin cross-wise slices of red onion, then cut into quarters; 3 cloves garlic, 1 Tbsp butter, ¼ cup heavy cream and 2 oz gorgonzola, crumbled. Using cast iron skillet, I sauteed onion and garlic in butter over very low heat (using simmer plate) until garlic softened. Then added cream and brought it to a boil. Stirred in cheese a bit at a time until melted. Adjusted seasoning with pepper. Cooked gnocchi in boiling water with freshly shelled peas, then spooned sauce over drained gnocchi/peas. Result: excellent. This recipe, adapted from one by Oregon’s Rogue Creamery (and published in our local Daily Inter Lake newspaper) does not have a creamy sauce; rather the cheese is broken into chunks and tossed with the gnocchi. I’ve not tried it yet. Chop fresh parsley finely; set aside. Crumbles gorgonzola into small bowl and set aside. Bring lightly-salted water to a boil; add gnocchi and cook gently according to package directions, just until they begin to float. Dan and return gnocchi to saucepan. Add olive oil and wine, tossing to coat. Add parsley and pepper to taste, and toss again. Add half the cheese and toss until cheese has mostly melted. Divide between serving bowls and top each with a bit of the remaining cheese. This entry was posted in Alcohol, Boiled, Dairy, Eggs, Fat or oil, Flour, Gnocchi, Herbs, Onion family, Sauteed and tagged butter, cream, egg, flour, gorgonzola, leek, olive oil, onion, parsley, potato, wine. Bookmark the permalink.